Since 2010 Miriam is an assistant professor at the Hydrology group. 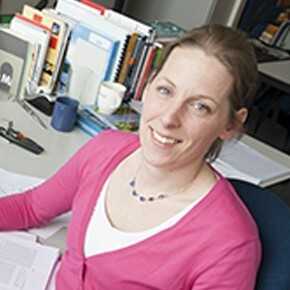 Her research focusses on understanding evaporation by using novel measuring techniques like Distributed Temperature Sensing and stable water isotopes. In 2015 Miriam was awarded with a VENI from NWO-ALW on this topic. Furthermore, Miriam supervises several BSc and MSc thesis-students and is involved in the courses: Hydrological Processes and Measurements (CIE4440), Hydrologie (CTB2420), and the minor course “Meten aan Water” (CT3412). Furthermore, Miriam is associate editor of Water Resources Research, and plays an active role as webmaster of the Boussinesq Center website and the Hydrological Science Division of the European Geosciences Union. Before Miriam started her PhD study she worked on her MSc-thesis about Gravity Measurements at the Water Resources Section. During her MSc-study in Hydrology she was also a student assistant, where she did several things like: maintaining website, organizing field trips, create posters and hydrological images, edit lecture notes and books, etc. Coenders-Gerrits, A.M.J., Hopp, L., Savenije, H.H.G., and Pfister, L. (2013): The effect of spatial throughfall patterns on soil moisture patterns at the hillslope scale, Hydrology and Earth System Sciences, 17, 1749-1763. Van der Ent, R.J., Coenders-Gerrits, A.M.J., Nikoli,R., Savenije, H.H.G. (2012): The importance of proper hydrology in the forest cover-water yield debate: commentary on Ellison et al., Global Change Biology, 18, 806–820. Global Change Biology 18, 2677–2680. Sutanto, S.J., Wenninger, J., Coenders-Gerrits, A.M.J., and Uhlenbrook, S. (2012): Partitioning of evaporation into transpiration, soil evaporation and interception: a comparison between isotope measurements and a HYDRUS-1D model, Hydrology and Earth System Sciences, 16, 2605-2616. Tsiko, C.T., Makurira, H., Gerrits, A.M.J., and Savenije, H.H.G. (2012): Measuring forest floor and canopy interception in a savannah ecosystem, Physics and Chemistry of the Earth, Vol. 47-48, 122-127. Gerrits AMJ and Savenije HHG (2011) Interception. In: Peter Wilderer (ed.) Treatise on Water Science, vol. 2, pp. 89–101 Oxford: Academic Press. Gerrits, A.M.J. (2009). Na regen komt interceptie. Stromingen, 15(1), 37-40. Gerrits, A.M.J., Savenije, H.H.G. and Pfister, L. (2009): Canopy and forest floor interception and transpiration measurements in a mountainous beech forest in Luxembourg, IAHS Redbook, 326, 18-24. Gerrits, A.M.J., Savenije, H.H.G., and Pfister, L. (2007): Forest floor interception measurements, IHP-VI Technical Documents in Hydrology, 81, 81-86. Gerrits, A.M.J., Savenije, H.H.G., Hoffmann, L. and Pfister, L. (2007): New technique to measure forest floor interception – an application in a beech forest in Luxembourg, Hydrology and Earth System Sciences, 11, 695-701. Winsemius, H.C., Savenije, H.H.G., Gerrits, A.M.J., Zapreeva, E.A., Klees, R. (2005): Comparison of two model approaches in the Zambezi river basin with regard to model reliability and identifiability, Hydrology and Earth System Sciences, 10, 339-352. Gerrits, A.M.J. : Hydrological modelling of the Zambezi catchment from gravity measurements, Master’s thesis, Delft, University of Technology, 2005.